In 2001, Parnassus Records was approached by a lawyer from France who claimed to represent the Estate of Sviatoslav Richter. He demanded that we pay the estate royalties for our "Sviatoslav Richter in the 1950s" series and that we withdraw the CDs and not publish any further Richter performances. We refused to acknowledge the legitimacy of this "Estate" and refused to make any payments. This led to our being sued in U.S. Federal Court. On advice of our lawyer we immediately suspended sales of our Richter CDs. Defending ourselves against this suit cost thousands of dollars (about the cost of a good new car), but we believed we were right in this matter. 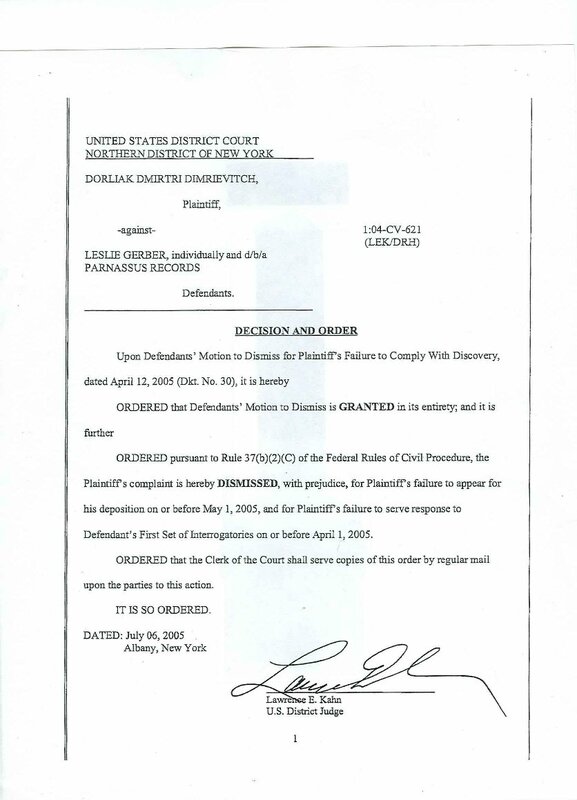 In June, 2005, the U.S Federal Court for the Northern District of New York dismissed the suit against us. Distribution of the "Richter in the 1950s" series has now been resumed, and the series will soon be extended with Vol. 5. We are hoping that later volumes will eventually continue this series.